Home / Logistics / Where do I build my warehouse? Before deciding how to shape a materials handling operation, companies need to consider where to build their new warehouse. E-commerce has revolutionised the game, and supply chains and markets are undergoing serious changes. Gian Schiava explores several recent surveys and helps us discover the best logistics hotspots in Europe. The choice of location for a warehouse is already a difficult one if the company only operates in one country. In some cases, companies decide to operate with regional depots served by one national distribution centre. Others may prefer to use just one large distribution centre. These decisions are affected by, for example, the product range, infrastructure, expected growth, local building regulations and, of course, cost and availability of real estate. After all, not many can afford to build a complete new warehouse. The alternative is to outsource to a 3PL (third party logistics) supplier who can perform many of the logistics activities, including stock ordering and invoicing. Even in the case of a company which just operates nationwide, it will most probably still import goods. They may be deployed in the production process or simply be part of the overall product offering. One therefore has to consider the proximity to ports or airports, and how easily goods can be transported (by rail, road or air) to the warehouse. Companies operating in different European countries have even more issues to consider. Where are the best locations to set up your new warehouse if you operate across the whole of Europe? What are the key influencers of this choice? Let’s take a look at a few recent research reports and publications. Apparently, the desirability of a location is mostly influenced by: 1) proximity to economic networks and strategic transportation access; 2) proximity to customers; and 3) labour availability and flexibility. Figure 1 shows a ‘map’, indicating the level of activity. 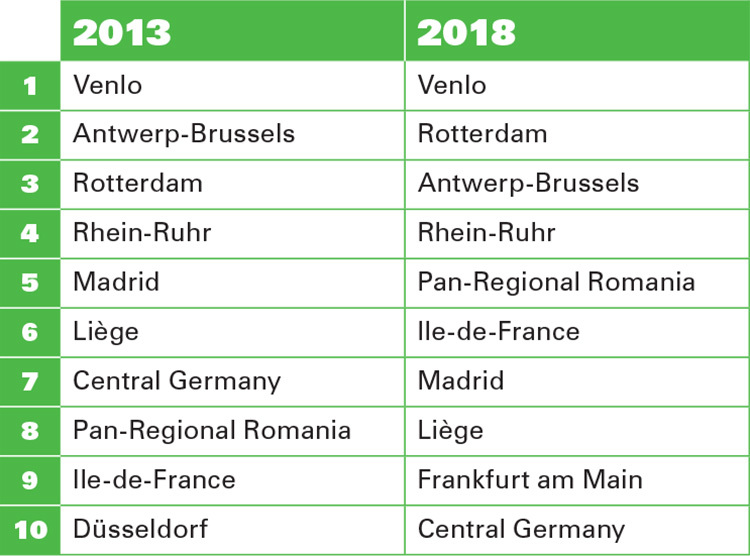 Given the ports in Antwerp and Rotterdam, it should be no surprise that locations in the Netherlands and Belgium are still in the lead, but it is also clear that Central and Eastern Europe are closing the gap quickly. Also, thanks to the proximity of large, wealthy populations, the position is still good for Ile-de-France and key German locations like Frankfurt. The survey explains that the need to balance warehousing and transport costs continues to be the core challenge. This is one of the reasons why warehouse owners expect companies to continue to consolidate operations. To put it simply, European distribution networks will increasingly take over the role of national or local networks. Drivers for change are general economic expectations and developments (outsourcing!) or even game-changing events like Brexit or the election of Trump. But on the micro-economic level we see influencers like fuel prices, availability of staff and local wages. Figure 1. 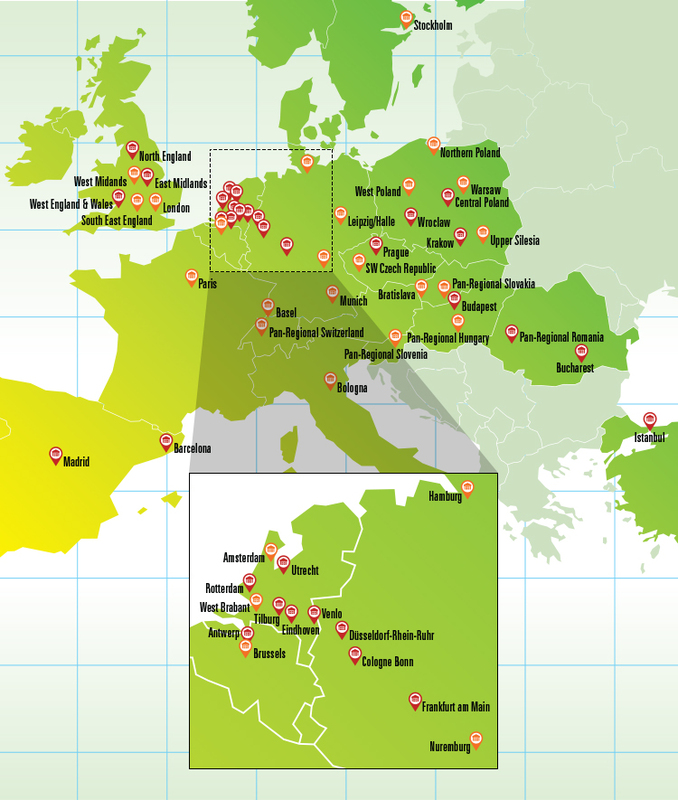 A map showing Europe’s top-ranked locations. To put it simply, European distribution networks will increasingly take over the role of national or local networks. Reports from the Dutch magazine Supply Chain Movement (SCM) show similarities with the findings of Prologis. They also highlight strong economic growth in the eastern part of Europe. This success is only partly explained by low wages. More significant, it seems, is the increased flow of goods from Asia, now travelling via the Black Sea or, as land freight, via the Trans-Siberian rail route, and thus supporting the rise of new logistics hubs in Central Europe. In addition, the rapidly growing GDP (Gross Domestic Product) in this region is pushing demand for consumer goods which can also arrive through fast-growing sea ports like Saint Petersburg on the Baltic Sea and Novorossiysk on the Black Sea. Finally, SCM reports notable growth for Valencia, Malta and Istanbul. The trend for consolidation may influence the size of the warehouse itself. If demand increases for modern, efficient distribution facilities we will probably also witness the rise of higher warehouses. According to American real estate specialist CBRE, we can expect a breakthrough of high-bay and multi-storey warehouses in Europe. The first explanation is not a surprise: limited availability of land, and/or high land prices. However, that has been the case for decades in Europe. But today it combines with the growing role of order picking within the warehouse. The e-commerce channel has shortened the pick process considerably and has turned the warehouse into a production factory. As order picking costs are generally high, companies need to make the most out of this process. Conveyors, labelling and packing machines, and software for stock control, all contribute to a speedy process. But the real gains are made when we seek productivity in height. Narrow aisle configurations are allowing more storage capacity per square metre and reach trucks or man-up trucks are replacing more traditional forklifts. The other option, of building additional floor levels within an existing building, is often more focused towards smaller goods in shelving systems, combined with conveyor of lift solutions. CBRE also points to the trend for city logistics; a development which sees sites being established in and around cities. In the case of large and dense populations, logistics operations face an increasing struggle to complete the last mile. Consumers may be served better by vertical logistics sites on the outskirts of the conurbation. These well-placed, often highly automated sites will help overcome accessibility and time-pressure challenges. 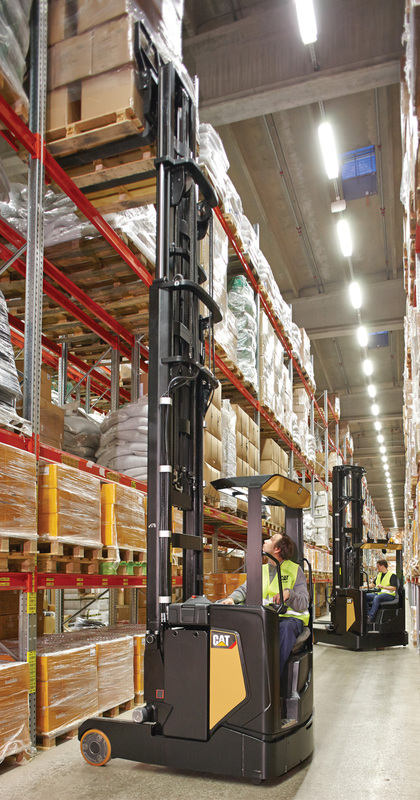  The Cat® NR14-25N2 reach truck is ideal for narrow aisles in the modern warehouse. Narrow aisle configurations are allowing more storage capacity per square metre and reach trucks or man-up trucks are replacing more traditional forklifts. 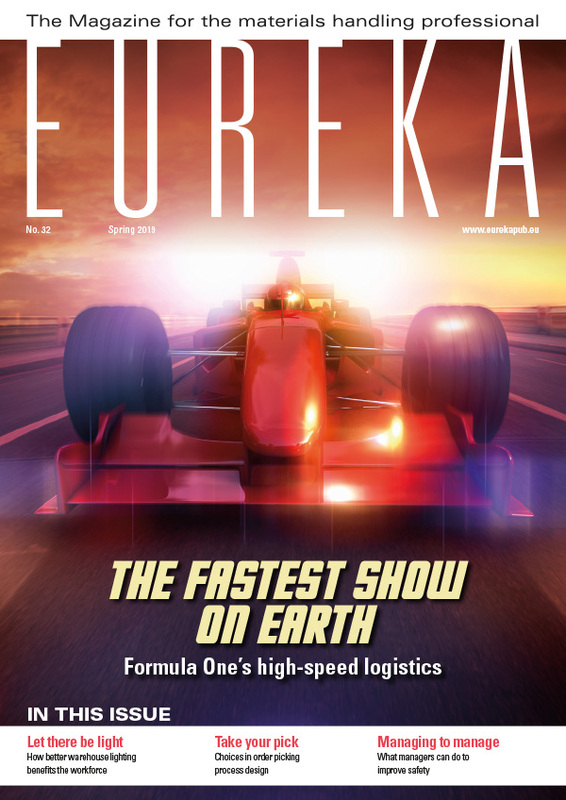 The European logistics landscape has always been a dynamic one, but recent economic developments may have accelerated the pace. Logistics hubs are rising in locations that we regarded as underdeveloped just a decade ago, and this will bring jobs and prosperity to those regions. Traditional strong hubs will have to reinvent themselves and their corridors to make sure their reason for existence does not evaporate.